Mia is just over 13 months old now. I’m pleased to report that she is starting to point out more and more things when Sasha and I speak to her, in both English and Russian. No words as yet…but it’s clear her understanding is developing in both languages. I know this seems incredibly premature, but if I’m being honest, I have been a little concerned about Mia developing a speech delay, purely because I’m unsure on whether Sasha and I are pursuing the right path in helping her become a bilingual speaker. It’s probably me being a bit paranoid, but I did do a little digging into what’s classed as a speech delay in infants. 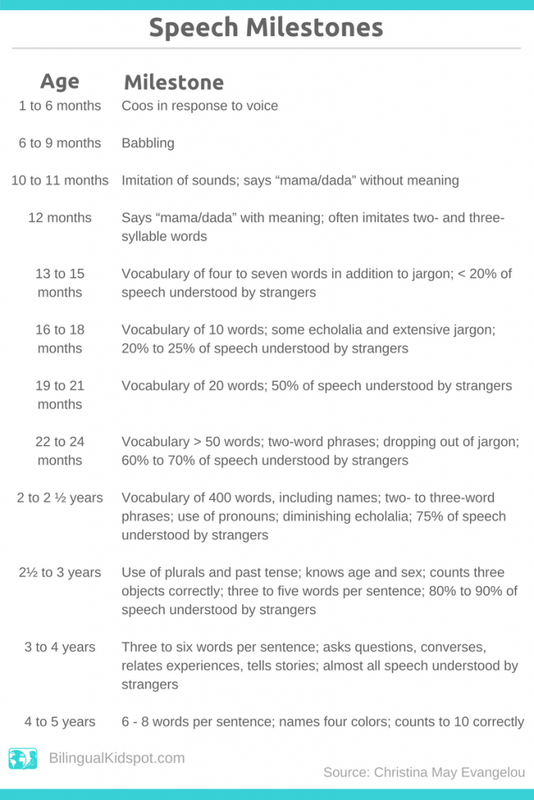 Here’s a graphic on speech milestones created by Christina-May Evangelou, who’s a “Bilingual Speech and Language Pathologist”. This comes from an interview she did for the website Bilingual Kid Spot. According to this, Mia should start speaking a bit soon, but if it doesn’t happen as quickly as we’d like, then it’s important not to worry too much. Although this chart might offer a rough guide, we all know children develop at different rates, whether that’s walking, talking or using the potty! Indeed Christina-May goes on to say the following, which offers some reassurance and encouragement to parents of bilingual children..
From now on, I’ll provide some updates on Mia’s language development in both English and Russian. I’ll include a vocabulary list of words she knows (see below), as well as a video of her pointing out things as I read to her (or some other activity). Hopefully there will be some clips of her speaking soon! To keep things simple, I’ll only write her new words in English, even though she might only know some in Russian, English or both. IMPORTANT – I’m not doing this to be a pushy parent. This is more of a case of motivating myself to be consistent in our strategy to help her become a bilingual speaker. I’m happy for Mia to develop at her own pace in everything she does. It might give you an idea of what to do (or not to do) if you have a similar aim for your child. These are words Mia currently understands, but doesn’t speak, in either Russian, English, or sometimes both languages. She might know a few more, as it’s hard to keep track of everything!